Alaska can be a stargazer’s dream location. The clear, dark night skies in winter offer the perfect viewing conditions to take in the beauty of millions of bright specks sparkling up above. Most of Alaska’s residential areas are surrounded by vast, untouched nature, so finding a peaceful spot to stargaze outside of city lights is an easy task. The seemingly endless, sunlit summer nights gradually begin to darken in August and September, bringing the night sky to life. The optimal stargazing time is between midnight and 3 a.m. when the moon is not shining as high in the sky. Barring cloudy conditions, the skies always hold the promise of a beautiful sight for a star-lover’s eyes. Alaska’s winter darkness lasts longer than most places, with skies beginning to lighten in March. A favorite constellation in the Last Frontier is the Big Dipper, or Ursa Major in its scientific term, meaning the big bear. Alaska’s state flag — a blue background with seven yellow stars shaped like the Big Dipper constellation and one representing the North Star — was created in 1926 by Benny Benson, a seventh-grade student from Seward who submitted the design in a contest for middle and high school students. The blue background represents the sky, sea, lakes and Alaska’s wildflowers and the Big Dipper symbolizes strength. The North Star on the flag is meant to represent Alaska’s northern location and a navigation tool for the mariners, explorers, hunters, trappers, prospectors, woodsmen and surveyors that have journeyed through the state. Both the Big Dipper and sister constellation the Little Dipper rotate around the North Star called Polaris, making a full circle each day, and are best seen in the northern hemisphere. 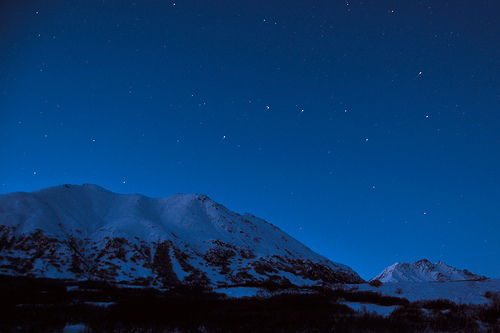 If astronomy is on your list of hobbies, Alaska certainly offers some of the best and most stunning stargazing sites surrounded by the state’s natural beauty. The following is a list of noteworthy events happening this year to keep an eye out when planning your next solar adventure in Alaska. Total Lunar Eclipse – On April 15, people across North America will have a chance to view the moon take on a rusty, maroon color as the moon, earth and sun line up and the moon passes through the earth’s shadow. The moon and Mars in one view – On June 7, directly after sunset, the moon will appear as close as two degrees to Mars. Break out your telescope to see these two planets through one scope. Venus and Jupiter’s close encounter – On Aug. 18, stargazers will witness the rare sight of Venus and Jupiter as they come less than a quarter of a degree apart. Partial solar eclipse – On Oct. 23, people in the Northwest U.S. will see the moon pass over a portion of the sun. Meteor shower – On Dec. 13, when darkness takes over the nighttime Alaska sky, find some light in this breathtaking display of disappearing streaks of light firing through the skies.